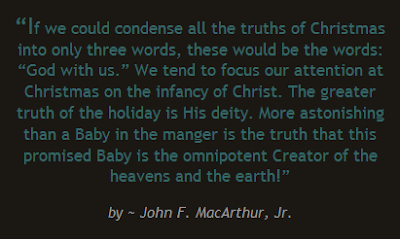 As I read this quote, I thought of how we celebrate the birth of the baby Jesus on Christmas. What came to my mind was the song "Away in a Manger". Joseph and Mary had no place to stay for the night and Jesus was born in a stable with the animals. I remember one year attending a replica of this scene at a local church with actors and live animals. But the reality is that the baby Jesus was actually ...God in the flesh. The miracle was that He was fully Divine and yet fully human. He humbled Himself and came to us. "Who, being in very nature God, did not consider equality with God something to be grasped, but made Himself nothing, taking the very nature of a servant, being made in human likeness. And being found in appearance as a man, He humbled Himself..."
Amazing love, how can it be? This was the greatest miracle of all. God came in the flesh. And because He came and died and was raised again to life, we can have the joy of knowing Him personally. Not in traditions and church rituals but in a personal relationship with the living God. The omnipotent Creator of the universe came to this earth and fulfilled Old Testament prophecy. He was born as a baby into this world for the purpose of living a perfect life and paying for our sins. How amazing is that? I have to say that this quote deserves to be a part of Bringing Holy back to the Holiday series. You can learn more about this movement here. You can join in and write about this Tuesday's quote by linking to Jennifer's blog. Wow, such a fantastic post sis, love you. I copied the quote and put it on our homeschool blog because it went so perfectly with what God put on my heart to share there today! You are going to love Scott's teachings - I'm beginning to edit them today! Praising God for all that He spoke through Scott the last month of teachings. Be patient as this time of year is busy and I have to paint three bedrooms before Lilly comes home! I'll do my best to get one or two teachings up this week and the same next! 2 John will be first, then Philippians! 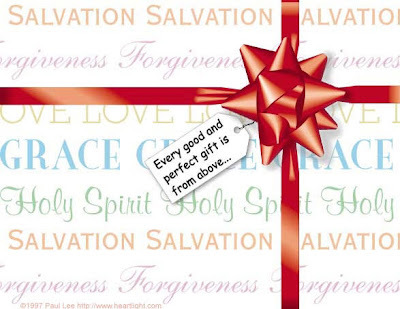 There is NO greater gift than SALVATION! Beautifully said Debbie! Bless you this holiday season! I agree...it is truly amazing! God with us. It is an astounding thought. Praise His Name, Immanuel. Well said....Funny, I was trying to post this same concept on my blog yesterday. Thanks for saying what I was trying to say.......God has given you an amazing writing gift! I almost couldn't read the message for that powerful and beautiful photo with the ribbon says it all!!! Loved what you wrote Debbie. He's so amazing and as I said that photo says it all in what JESUS' coming has meant for all of us. Incredibly beautiful post. I love the picture of all God's gifts "wrapped up" and yet you so beautifully portrayed how it is much much more than a present or a day! Great quote! :) I'm pasting it into my journal! What a tender, personal and vibrant giving of the Gospel! Debbie, this is a beautiful post...I love the quote, and it is so true...God IS With Us! He came as a baby, and yet, with all deity and power. I think we often miss that truth in our Christmas carols. I also appreciate Lisa's Bringing Holy Back to the Holiday...we've lost the reverence of the season. I can remember a different time, and I miss it so...all we can do now is keep Jesus in our own activities, and pray the world will see His light in us. I don't remember the Phoenician Resort when I lived in Phoenix, but that was a long time ago. I would love to find it when I visit there again, and have tea! For me, Debbie, the "taking of tea" has become a time of spiritual refreshing...in my hectic and chaotic life, stealing a few moments for myself, sitting with either a devotional or the Word, and a cup of tea is like a shot in the arm of the Holy Spirit's power...He speaks to me about things, and encourages me to not give up. Going out to tea doesn't do the same thing, but it is still a wonderful way to fellowship and have a bit of fun, in a modest and lady like fashion. Far from my normal behavior...I'm somewhat of a goofball...it gives me a chance to engage in proper etiquette, which also seems to be disappearing from the scene. Thank you so much, dear Debbie, for always providing a relevant post that comes from the deep well of your heart's desire to know the Lord better. I pray for my love to deepen, for my understanding to grow, and for my witness to make a difference. Yours definitely does! Bless you...have a beautiful day, my friend! Emmanuel is one of my favorite names of God. Amazing love indeed. God in the flesh coming here to be WITH us. Praise the Lord! Take care and thanks for sharing today. It's incomprehensible, isn't it? God with us. I often wonder if I would have recognized him had I been on earth at the time. We are blessed, indeed. Nice post, Debbie. Debbie, I actually found the "Bringing Back Christmas" while perusing your blog and I "stole" the blue ribbon idea too. Debbie, I love this and never tired of hearing this sweet message! Your graphics are powerful, too. Merry Christmas sweet friend. Yes, we instantly think of "Away in a Manger," yet God isn't "away," He is here, "with us." Immanuel - God with us. Excellent post! It's a great message, Debbie. Thanks for sharing. Ooops! I just used my hubbies account above...lol.